Medialens is a UK-based media-criticism website which uses the term “smear” more often than anyone else I’ve encountered. Google lists hundreds of pages at Medialens.org which contain the words “smear”, “smears”, “smeared” or “smearing”. And yet… the first time I witnessed a smear campaign played out before my eyes, it was conducted by Medialens (against Iraq Body Count, IBC, the antiwar volunteer group). And it went on for months. IBC was branded, insanely, by Medialens’s followers as “actively aiding and abetting in war crimes”. 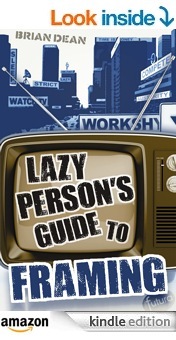 (The Observer’s Peter Beaumont described Medialens’s attacks on IBC as “deeply vicious”). One of the few people to document this – without being swept up in the anti-IBC hysteria – was Robert Shone (you may already be familiar with Shone’s brilliant, widely-read piece about the Guardian’s “reporting” of the Luis Suarez affair). In a long article published by ZNet, Shone detailed the errors and falsehoods which formed the basis for Medialens’s rhetorical attacks on IBC. To my knowledge, nobody has refuted any of the points made in Shone’s well-researched article – but Medialens’s false (and reputation-damaging) claims continue to circulate, without any correction or apology from Medialens’s “editors”. Cromwell’s “reason” for not responding to Shone’s ZNet article is, of course, nothing more than an unpleasant character slur (or “smear”). And from what I’ve seen of Medialens, this is typical of the way they dismiss persistent criticism from “unimportant” people (their treatment of Daniel Simpson, the former NYT journalist, is another example). I’ll quote some excerpts from Shone’s ZNet piece below – see for yourself if it expresses “unreasonable” “obsession” and “inner turmoil”. 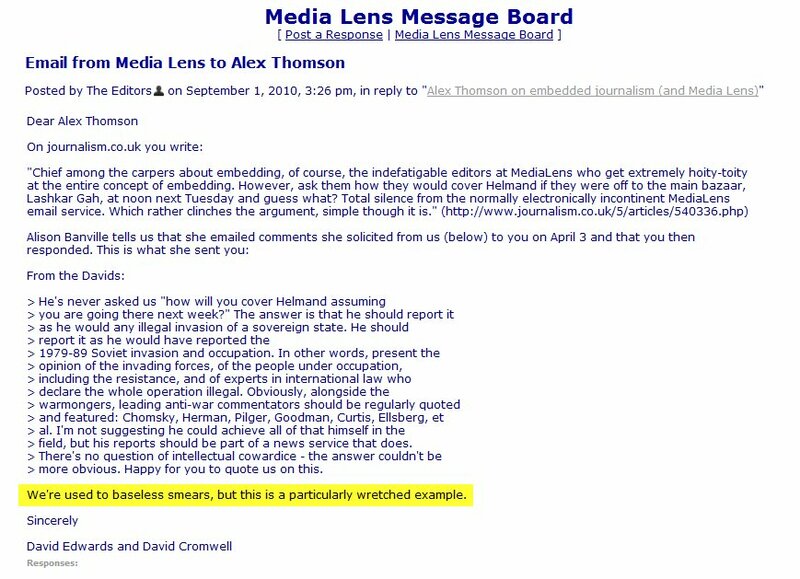 (Incidentally, Shone quotes, at his blog, some of Medialens’s earlier responses – those which “dropped off the bottom of the message board” – they make amusing reading). Many incidents/deaths in IBC’s database are from the major wire agencies. This reflects the real-world fact that these organisations pick up the highest percentage of incidents. For example, of all incidents from July 2006 to March 2007 (as documented by IBC), Reuters picked up approximately 50%, compared to 35% from Al Sharqiyah TV (another IBC source), with much lower coverage by other media sources, “Western” or “non-Western“ (IBC). Note also that at the level of reporting utilized by IBC, the dichotomy of “Western” vs “non-Western” is false, as agencies such as Reuters employ (for example) Iraqi journalists in covering Iraqi incidents. This is a bizarre statement, as the IBC database rarely attributes deaths to “insurgents”. In most cases IBC’s database doesn’t directly identify perpetrators, but simply lists the reported target and type of attack. Contrary to what might be inferred from Media Lens’s statements, deaths not clearly attributed by IBC to the ‘coalition’ are not attributed by default to the ‘insurgency’. IBC pointed out in a press release (March 9, 2006) that “the majority of media reports do not allow a clear identification of the perpetrators or their motives”. IBC stated that “unknown agents” did most of the killing, and that this could include US-led forces. In another analysis [p23-26], IBC focused on deaths “definitely attributable to coalition forces”, and concluded that “IBC and Lancet  show broadly comparable proportions of deaths attributable to coalition forces”. According to this analysis the Lancet 2004 estimate shows that 43% of violent deaths (for the whole country outside Falluja) were directly caused by US-led forces, compared to IBC’s 47% over the same period. This is incorrect in two ways. First, the Lancet study didn’t estimate “civilian” deaths as Media Lens claims (its estimate includes “combatants” as well as civilians). Second, IBC records only violent deaths, so the comparison should be between 57,600 and 17,687 (57,600 being the Lancet study’s estimate of violent deaths, according to Lancet co-author Richard Garfield). But even that isn’t comparing like with like, since IBC does not include combatant deaths, whereas the Lancet study does. The claim that IBC provides the “lowest estimate” of “eight serious studies” has been widely circulated but is completely mistaken. It’s based on a collection of errors and misconceptions (which were exposed in detail by IBC in 2006), including an error from Les Roberts (Lancet study co-author) which Roberts has acknowledged to be an error. (“I said the IBC count was 17 deaths per day over the period 3/1/03 – 2/1/05. That was wrong.” – Les Roberts, email to Gabriele Zamparini, June 2006). The first problem with this is basic arithmetic. IBC’s minimum figure for the period in question (approx 35,000) was 17.5% of Roberts’s lower figure and nearly 12% of his upper figure. Not “less than five per cent”. The second problem is that it’s inconsistent with the findings of the Lancet 2004 study (co-authored by Roberts). IBC’s earlier count of violent civilian deaths (17,687 for the relevant period – see above) was 30% of Lancet 2004’s estimate of violent deaths (57,600). It’s interesting to note that later estimates, eg from the Iraq Family Health Survey and the Centre for Research on the Epidemiology of Disasters, suggest that IBC is capturing around a third, or more, of violent deaths – contrary to the claims promoted by Media Lens. This is clearly untrue. IBC have always stated that “many if not most civilian casualties will go unreported by the media”. (Media Lens had actually quoted this statement from IBC in an earlier Media Alert). IBC have issued similar statements throughout their website and press releases – for example: “Gaps in recording and reporting suggest that even our highest totals to date may be missing many civilian deaths from violence” (IBC’s front database page). FURTHER UPDATE: Media Lens continued their campaign against Iraq Body Count, in 2015, by promoting an ugly smear piece about IBC. Media Lens’s role in promoting this set of smears is noted here. * IBC’s Josh Dougherty suggested that Medialens’s policy for banning people was “biased” against IBC’s supporters. 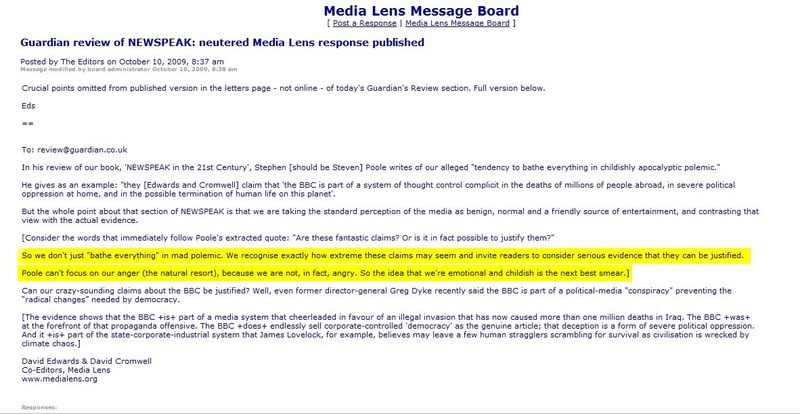 Medialens’s editors replied (on their message board, April 2006) that this was an “outrageous smear”.